Mars is known to have abundant H2O in the gas (water vapor) or solid (water ice) phases, but until very recently it was not thought that liquid water could exist on Mars. In the past few years, however, orbiting spacecraft and rovers on Mars have collected data suggesting that liquid water may exist on the surface or in the shallow subsurface for at least some portion of the Martian year. Pure liquid water is not thought to be stable due to the low pressures and temperatures found on the surface of Mars; however, salts such as perchlorates and chlorides are present in the Martian soil and may play a key role in stabilizing liquid water. 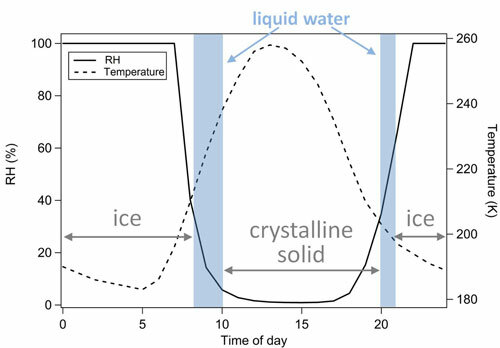 In the Tolbert group, we experimentally study the formation and stability of liquid (aqueous) salt solutions under low temperature conditions relevant to Mars. We are particularly interested in deliquescence, which is a relative humidity-induced solid-to-aqueous phase transition. A particle deliquesces by absorbing water vapor from the atmosphere when a threshold relative humidity value is reached. This deliquescence relative humidity (DRH) varies with salt composition as well as temperature. The reverse process, the recrystallization of a salt solution into the solid phase, is called efflorescence and occurs at the efflorescence relative humidity (ERH). Kinetic effects inhibit nucleation of a crystalline phase and cause the ERH to be lower than the DRH. This hysteresis effect allows metastable, supersaturated solutions to exist when the humidity is below the DRH but above the ERH. Our experiments use Raman microscopy (see schematic below) to determine the DRH and ERH values of Mars relevant salts and salt mixtures under a range of low temperature conditions. Knowledge of these values is necessary to predict when and where aqueous salt solutions could exist on the surface of Mars. Thus far, we have found that perchlorate salts are highly deliquescent, absorbing water vapor and forming an aqueous solution at very low DRH values. Sodium perchlorate (NaClO4) is particularly deliquescent (DRH values are as low as 40%) and this salt can exist in a metastable, supersaturated aqueous phase until the ERH of 13% is reached. We have shown that NaClO4, if present on the Martian surface, would likely be in the aqueous (liquid water) phase for 2 to 3 hours per sol (a Martian day). Currently, we are exploring the effect of additional ionic species on the DRH and ERH values. 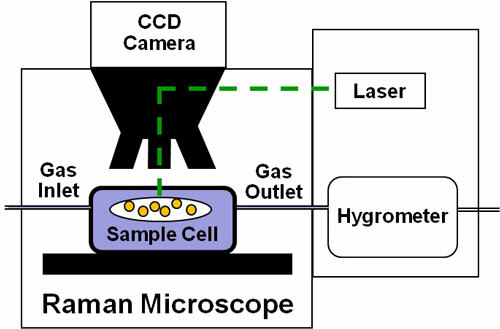 Schematic of the Raman microscope used to determine the DRH and ERH of Mars relevant salts. Conditions inside the sample cell can be varied from 0 to 100% RH and from 223 to 273 K.
We can determine the phase of a salt particle and thus determine the DRH and ERH of that salt by using Raman spectroscopy and optical microscopy (inset images). 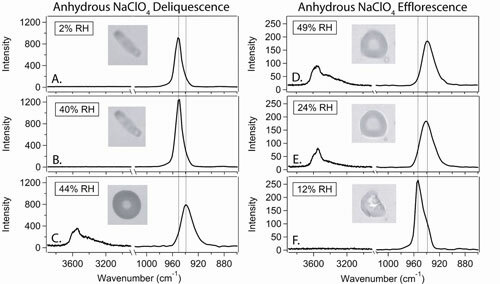 Figures A, B and C show a NaClO4 particle deliquescing at 243 K. Figures D, E and F show a NaClO4 particle efflorescing at 243 K. Each image is 40 µm wide. As the RH in the environmental cell increases and decreases, spectral changes appear in the O-H stretching vibration region (broad peak at ~3500 cm-1) and the ClO4- symmetric vibration region (~950 cm-1). Visually, the particle is spherical and darker when liquid (deliquesced) and less spherical and lighter when crystalline (effloresced). Sodium perchlorate (NaClO4) salts could be deliquesced (i.e. : exist in the aqueous phase) for 2 to 3 hours per day! This figure shows a modeled RH (solid line) and surface temperature (dashed line) as a function of time of day on Mars at the Viking 1 landing site. We use our experimental data to predict when aqueous NaClO4 solution can exist. In the late evening and early morning, ice will exist. In the warm, dry afternoon, the crystalline salt (likely the anhydrous form) will be present. For two periods of time in this particular Martian day, during the late morning and then again during the evening, either stable or metastable aqueous perchlorate solutions can exist (blue shaded regions).